Even for a club based in the "Cradle of Football", Everton's history is startling. In their 138 years of existence, they have spent only four years outside the top flight of English football. During this time, they have won nine League titles, five FA Cups and the 1985 Cup Winners' Cup. Since 1892, the club has been playing its home games at Goodison Park, the first major football stadium in England. 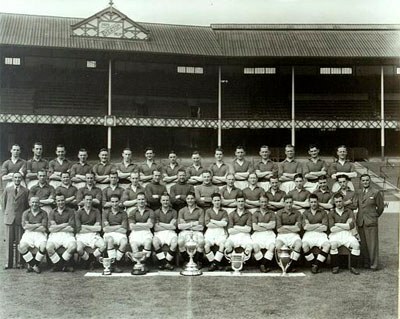 Everton squad in the season 1939-1940. The Everton Football Club was originally brought about by St. Domingo Church Sunday School. After two years as St. Domingo’s FC the named was changed to Everton, after a district in Liverpool. 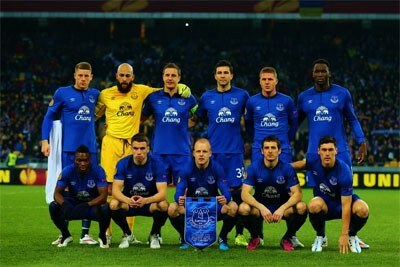 Everton FC quickly emerged as one of the top football clubs of their era. They were among the twelve founding members of the Football League, the first professional football competition in the world. Their first taste of silverware came in 1891, with the club winning its first League title in a dominating fashion. In 1893, they reach their first FA Cup final (a loss against Wolverhampton). It wasn't all roses for the club, however; Everton would finish as runners-up five times before claiming their second League title in 1915, with only a single FA Cup victory in between. Everton returned to the football map with the acquisition of Dixie Dean from Tranmere Rovers in 1925. On the back of Dean's incredible 60 league goals – still the English top-flight record – Everton won their third League title in 1929. Dean remained a prolific striker in the years to come, leading Everton to another League title in 1932 and an FA Cup in 1933. He left Everton as their top goalscorer of all time, with 349 goals in 399 appearances. After winning their fifth League title in 1939, the outbreak of the Second World War stopped Everton's era of dominance in its tracks. The post-war period was far less kind to the club, which initially struggled to rediscover their earlier form. Their fortunes changed with the appointment of Harry Catterick as manager in 1961; under his authoritative presence, Everton claimed another League title in 1963. In 1966, they came from 2-0 down to beat Sheffield Wednesday in a memorable FA Cup final. The club won their seventh League title in 1970, but the rest of the decade was a fairly disappointing affair, mostly due to their arch-rivals Liverpool dominating the domestic competitions. Everton's final claim to fame came in the mid-80s, with Howard Kendall taking over managerial duties. After winning the 1984 FA Cup, the club one-upped it with their first Double the following year; after claiming a League title, they won a Cup Winners' Cup by defeating Rapid Wien 3-1 in the final. Under Kendall, the club would win their ninth (and as of yet, final) League title in 1987, with the Heysel tragedy preventing them from competing for European trophies. The club was far less fortunate in the Premier League era, with the 1995 FA Cup being their only trophy in the two decades that followed. After being regulars in the lower half of the league table for a while, they had a mini-resurgence under David Moyes, who led the club to a fourth-place league finish in 2005 and the FA Cup final in 2009. During the years 2007-2014 Everton managed to place themselves at the top half of the league table every season. Everton has been using several logos over the years. In some the "EFC" letters have dominated, in others the drawing of Prince Rupert's Tower, which is located in Everton Brow, has been most visible. Since 1938, a motto in Latin has been visible in most versions of the logo: "Nil satis nise optimum" and means in English "Nothing but the best is good enough". 1878 The club is established (as St. Domingo’s FC). 1880 The club change its name to Everton. 1886 First FA Cup appearance. 1888 Everton are one of the teams included in the new Football League. 1891 First time winner of First Division. 1892 The team's first game on Goodison Park in September against Bolton. 1906 Winning their first FA Cup trophy. 1985 Winning the UEFA Cup Winners' Cup. 1985 Winning their first Double (the First Divison and the Cup Winners' Cup).